Clean, condition, and protect in on step! IGL Ecoclean Wash is designed as a safe and effective alternative to the hazardous shampoos on the market today. IGL Ecoclean Wash is not formulated with harmful solvents and VOCs (Volatile Organic Compounds), it is instead designed using a unique blend of surfactants and waxes combined with a water base. IGL Ecoclean Wash provides plentiful lubrication during the washing process that will allow you to remove the dirt and debris that plagues your paint with reduced risk of scratches and swirls. The protection provided by IGL Ecoclean Wash will keep your vehicle clean much longer than a standard shampoo would. It is clear to any detailer just how important it is to wash your car on a regular and routine basis. This level of maintenance cleaning will prevent the serious and harmful buildup of dangerous contaminants and hazards. However, when you are washing your car, you can’t just use any soap or shampoo you happen to have lying around the house. While it may not seem like it, you paint is extremely sensitive and prone to permanent damage should you use a cleaner that is too aggressive. Luckily, IGL Ecoclean Wash give you an alternative to the harmful, solvent infused shampoos that exist today! Safely wash your car's exterior with IGL Ecoclean Wash! On top of being safe for your paint, IGL Ecoclean Wash is also safe for both you and the environment as well. This is thanks to the VOC-free and water-based formula of IGL Ecoclean Wash! One of the largest causes of scratches and swirls to your paint is actually the washing process itself. This is because in order to properly remove the dirt and contaminants that collect on your paint, you need to use a sponge or other washing apparatus to generate agitation. This can cause the dirt and contaminants to be rubbed against the paint, instilling “wash-induced swirls” in your paint. IGL Ecoclean Wash avoids this unfortunate and common issue thanks to its abundances of effective lubricants and waxes. These lubricants will greatly reduce the friction created on the surface of your paint, making sure that the necessary agitation does not cause further damage in the process. 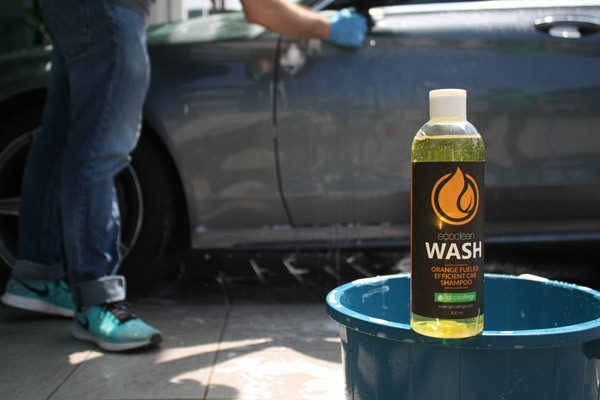 IGL Ecoclean Wash goes one step further than your average car shampoo by instilling a level of protection to your paint after the washing process. This level of protection will prevent the likelihood of future buildups of dirt and contaminants, greatly reducing future risk to your paint! 1. For a standard wash, dilute IGL Ecoclean Wash 1:100 with water. cobra-waffle-weave. 2. Mix the solution thoroughly and wash your car as normal.cobra-waffle-weave. 3. Thoroughly rinse the surfaces of your car with clean, fresh water. Dry your car completely. 500 ml. | 16.9 oz.